The name Ducati conjures images of stylish, iconic and world-beating motorcycles and the iconic brand has announced that it will exclusively unveil six of its latest models to the Irish public for the first time at this year’s Carole Nash Irish Motorbike & Scooter Show this March in the RDS — including the much sought after Monster 1200S. 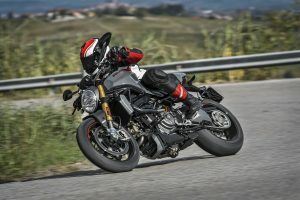 The Monster is considered by some enthusiasts as the brand’s most iconic motorcycle of the past 20 years, and its reputation has been enhanced by new models which have more power, better handling, improved electronics, higher safety specs and a higher standard of comfort than before. The 1200S, is built on a new frame, resized the chassis and has a redesigned bodywork. In addition to its higher-calibre suspension and brakes, the Monster 1200S has a carbon fibre front fender, new triple Y-spoke cast aluminium wheels with exclusive “S” graphics, an LED daytime running light and LED turn signals. Borrowing some of the technology from the 1299 Panigale Superbike, the newest model S is also equipped with a more advanced electronics package, including a full-colour TFT display, Bosch cornering ABS, Ducati Wheelie Control and Ducati Quick Shift, which allows clutchless upshifts and downshifts — all of which make for a more agile, safer and comfortable ride. The S manages to achieve all of this while entertaining a 1200cc Testastretta six speed engine. The bike adheres to the Euro 4 emissions standards yet manages to produce around 150 horsepower at 9,250 rpm and 93.1 pounds of torque at 7,750 rpm. The bike will be available in Ducati Red or Liquid Concrete Grey. With three customisable ride modes (Sport, Touring, and Urban) this motorcycle is a better and safer ride for all motorcyclists, regardless of speed or skill. Ducati will also be launching the Monster 797, Multistrada 950, Scrambler Café Racer & Desert Sled as well as the newest Supersport.